In Heart of downtown and it is one of our top choices. This restaurant is walking distance to the downtown Victoria seaplane terminal. We can see the seaplane terminal from outside the restaurant. Its one of the best places in Victoria downtown for seafood and steak. Location – right at the corner of Broughton and Wharf street overlooking inner harbor. Entrance is from Broughton street. No one wanted to get wet before lunch. Finding an easy parking spot close to a downtown restaurant is a challenge. We felt Nautical Nellies was the perfect choice. The parkade is just across the road - few steps we were inside the restaurant. It is a non-stop restaurant that means they do not shut down in the middle of the day between lunch and dinner. So it is a good place to go even you are bit late for typical lunch time. We went to lunch on a very odd time (past 3pm) to celebrate our dad's birthday - Restaurant was open and not crowded. Our waiter seated us at a nice comfortable table. He is friendly and made us feel welcome. There were plenty of options to select on there lunch menu. It was a very late lunch for us and we were starving too. While our lunch was getting ready I took some time to looked around to see eye catching artwork inside the restaurant. Our growling stomachs didn't have to wait too long. Our food plates started to arrive. The service was prompt - they didn't keep us waiting for too long. 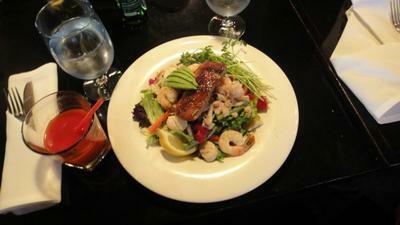 I had delicious sea food salad, My husband had a Halibut burger, salad and a beer. We ordered a kids meal for Lapaly. Before her meal she found her favorite coloring pictures with a crayon box. She thoroughly enjoyed her art work and I had to help food into her mouth. However her meal has to be tasty - she didn't leave any food in her plate. 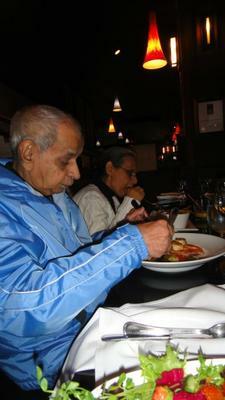 Mom and Dad had delicious Salmon and rice meal which they could not recall the name but said taste rely good. They love and remember delightful ambiance inside the restaurant and the easy location to park in middle of downtown. We like the average portion they served because after the meal we still had more room for delicious deserts they serve. 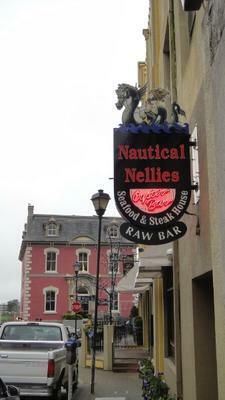 So, if you like dining out in a glamorous restaurant in Victoria downtown don't miss Nautical Nellies Enjoy! Join in and write your own page! It's easy to do. How? Simply click here to return to Share Your Victoria BC travel Stories/Tips/Favorites.